The Israeli soccer team Beitar Jerusalem announced last Thursday that for the first time ever its players would walk off the pitch in the event of racist chanting by its supporters. Journalist Raphael Gellar reported that punishments would be staggered. The first instance would lead to a pause in the match and the second, depending on severity, to a delay of 15 minutes or even to the players walking off the pitch for good. Huge news from Beitar Jerusalem. Club announces the players will stop playing & leave the pitch if there are racist chants from crowd. Beitar Jerusalem is one of Israel’s most successful and venerated teams, and it is a connection to a bygone era in which Israeli sports were intensely politicized. Most connections nowadays are vestigial, but Beitar Jerusalem still strongly connotes right-wing politics. It’s also Israel’s most penalized team as a result of years of racist chanting against Arabs and violent behavior of its fans who compose the right-wing ultras group La Familia. Their antics have brought international condemnation to the club and to Israeli sporting authorities who have previously treated Beitar Jerusalem with gloves off. There is some disagreement about the instigator of the announcement and its motive for doing so. 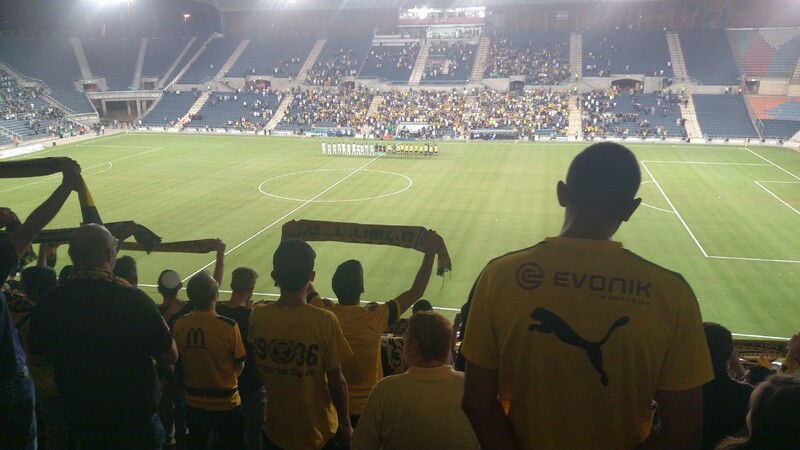 Gellar reports that Israel’s Football Association and Premier League were jointly behind it, signaling a much more serious approach to tackling racism in Israel’s stands and especially that of Beitar Jerusalem’s. This fits neatly within an anti-hooliganism initiative launched over the summer by the Israel Police to curb soccer-related violence and racism. Several months ago Lt. Micky Rosenfeld, foreign media spokesman of the Israel Police, told me that “Beitar Jerusalem hooliganism is the main focus” of these expanded operations. The most attention-grabbing of these operations involved a six-month investigation of La Familia members suspected of weapons trafficking and attempted murder. It culminated in a two-night sting operation and the arrests of 73 people. There’s also speculation that Beitar Jerusalem’s owner, American-Israeli businessman Eli Tabib, decided on the policy. Tabib had consistently refused in the past to comment publicly on instances of racism in the stands, in large part out of a calculation not to upset La Familia. Not because he agreed with them, but because they credibly threatened his and the team’s safety, if he rebuked them too much. He didn’t need to look far back in Beitar Jerusalem’s history to see what he risked. The owner before him, Arkadi Gaydamak, had hired two Chechen Muslims in January 2013. La Familia harassed the Chechens endlessly, as well as players who defended them. They brandished a banner saying “Beitar will be forever pure [of Arabs and Muslims]” and walked out of the stadium when one of the Chechens scored for Beitar. And in February 2013 three kids in La Familia burned the team’s clubhouse down. Tabib had decided to walk the fine line between mollifying its practices and the IFA’s punishments. Announcers would make anti-racism statements before matches, and last season, Beitar Jerusalem played the entire season with the message “No to Racism” on its jerseys. But he mostly stood by as team finances and point totals took a hit from their actions. Nine days before the announcement, Beitar Jerusalem had narrowly lost to Bnei Sakhnin, Israel’s highest-profile team with a predominantly Arab identity. The match had been tense from the beginning, and Beitar Jerusalem’s supporters lobbed chants of “terrorist,” “burn your village,” “Muhammed is dead,” and “Death to the Arabs!” at Sakhnin’s Arab players and fans. That last chant had always traditionally incurred penalties from the IFA, and perhaps it was the final straw. So perhaps the announcement was about Tabib covering himself, “finding a way to avoid fines,” as described by Gal Karpel, the managing director of the Kick Racism out of Israeli Football initiative of the New Israel Fund. Afterwards, all eyes were on Beitar Jerusalem’s next match, which was Monday against league leaders and Europa League Cinderellas Hapoel Beer Sheva. The gauntlet had been thrown. At the outset, the possibilities were simple. Either La Familia would call Beitar Jerusalem’s bluff or it wouldn’t. If it did, would the threat be carried out, which would have serious repercussions for scheduling and match outcomes, or be proven hollow? More difficult to predict ahead of time was what Beitar Jerusalem or the IFA would characterize as adequately racist. Previously penalties lobbed on Beitar Jerusalem had come only from chants explicitly racist toward Arabs or Arab players. Chants like “here comes the most racist team in the league” had avoided scrutiny because they lacked an object. The match was supposed to be at Beitar Jerusalem’s home, but because of the chaos against Sakhnin, the IFA had imposed the penalty of a “radius-match.” Beitar Jerusalem would be forbidden from playing its next home game within a specific distance from its home. The match moved to Petah Tikvah, a town 75 kilometers to the northwest. Once play started, the worries dissipated. The only timeout was for halftime. It was felt at no point that the players needed to leave the field. 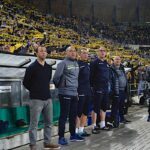 There was one chant of “here comes the most racist team in the league,” as Beitar Jerusalem entered the field, and a handful of fans targeted an Arab player on Beer Sheva as a “sheep fucker” in the 75th minute, but they were quickly shushed by those around them. Beitar Jerusalem lost 3–1, conceding three straight after going ahead. The threat had kept its credibility, but it’s too early to celebrate. Those in the stadium were cowed to stay quiet, but the radius punishment had discouraged much of La Familia from attending. Gal Karpel sees some success, but worries that keeping the threat up going forward is only “half realistic.” This threat of massive retaliation could lose credibility if very small infractions are tolerated to avoid the larger disturbances that would result from teams arguing over the outcome of an abandoned match or the dysfunction that could creep into the Premier League’s fixture list. It’s a complex deterrence policy, more typical in Israel’s policy versus terror groups than its soccer league. For what La Familia and others in Beitar Jerusalem’s crowd really feel about the ban, we’ll need to wait for the team’s next home match. On Saturday against Maccabi Petah Tikvah, we’ll know if it was a fluke or if this most recent step in confronting racism in Israel’s stands is the real deal.